RVGL has been updated to 19.0210a! This release adds support for mouse controls. To enable mouse mode, set your controller to Keyboard / Mouse and configure controls as usual. You should be able to map controls to mouse axes, buttons and wheel along with keyboard keys. Steering sensitivity is currently hard coded to default deadzone and range settings, but this may change in the future. For car authors, there are new keys to be configured in the CAMATTACHED parameters section. 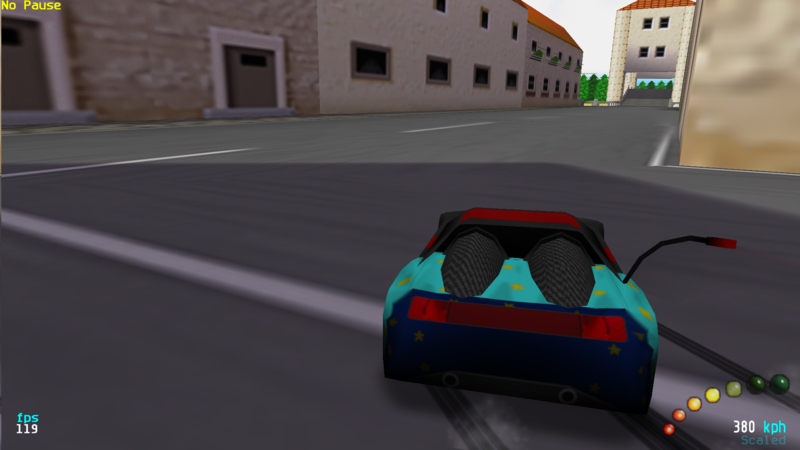 The hood view and rear view cameras can now be either fixed to the car (the current and default behavior) or allowed to move freely. The look and position behavior can be tweaked separately. The options affect both hood and rear cameras at once. There is now support for storing textures in compressed format. To enable this, set CompressTextures = 1 in rvgl.ini. The only supported format is currently S3TC (the DXT5 variant), which requires a special OpenGL extension. Support for centralized network mode (-nop2p) has improved. Certain weapons like bomb and electro pulse are handled by the server which should result in better gameplay under high latency conditions. Further, lagging / inactive cars (those found blinking) have collisions disabled. Session log file now specifies the network mode (P2P / Centralized) and player type (Server / Client) in the CSV header. New command lines added: -savereplays to automatically save Multi-Player replays (#520), and -showping to view ping info with Left Ctrl + Numpad Enter. Force Feedback support should be working now in Multi-Player and Spectator mode. Controller config experience has improved and it should now avoid triggering rear view / camera change while configuring those keys. "Set controls to default" has been moved into the config menu for quicker access. Support has improved for older graphics chips. The minimum requirement for running RVGL has reduced to OpenGL 1.1. It is ensured that rvgl.ini is always created in case there was a video error, which makes it easier to switch to the legacy renderer on new installations. Shader Renderer: Better optimized for more than 10 level textures and improved memory management. Bullet point (•) now renders properly (includes updated font file). Replay files now save car skins info. Note though that replays saved with the previous version are no longer compatible. Shader: Fixed a glitch with semi-transparent meshes (eg, the waterfall in Ranch). Shader: Uniform Buffer Objects support should be more stable on some GPUs. Android: Car selection screen is improved for Portrait mode. Fixed missing instances at Create Profile screen. Prevent greyed out 'Unknown' resolution in Video Settings. Fixed Time Trial 'beaten' progress not saved for custom tracks in some cases. Several fixes for saved replays support. - New symbols in font file for bullet point (•) and double dagger (‡). - Better support for legacy OpenGL devices (1.1 and above). S3TC (DXT5) compression for all textures. existing replay files). Also updated game_gauge_replay file. - Replay selection menu provides more space for level name. checks to prevent potential crashes during buffer loading. more than 10 level textures. - Shader: Ensure alpha testing turned off for reflective surfaces. - Updated video caps info log. - Numpad Enter can now be used in the menus. - Reset Controls option is moved into Config Controls menu. - Car skins are now synchronized when using random cars mode. player type (Server / Client). - Lagging remote cars (those displayed as ghost) have collisions disabled. tag 'fox' transfer are now server controlled. - Waiting Room shows Mode for collision type and On / Off for pickups. - Fix level length not updated in Select Replay and Overview menu. - Fix missing menu entries when going back from Select Replay menu. - Fix crashes when playing back bad replay data. - Fix Time Trial 'beaten' progress not saved for custom tracks. - Fix level search filter still active in Best Times menu. - Fix missing instances at Create Profile screen. - Fix greyed out 'Unknown' resolution in Video Settings. - Ensure 'rvgl.ini' is always created (eg, upon video errors). - Shader: Attempted fix for UBO glitches on certain GPUs. - Shader: Fix glitch rendering transparent meshes (eg, Ranch waterfall). - Shader: Fix transparent poly count not updated in debug display (F9). - Android: Fix car selection screen cut off in Portrait mode. - Better conflict prevention between menu and in-game controls. - Fix non-working force feedback in multiplayer and spectator mode. - Fix glitch when typing vertical bar (|) in chat. 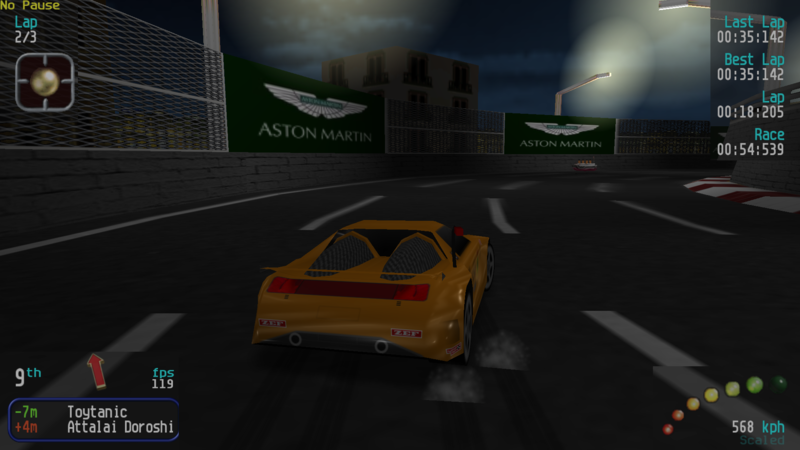 - Ensure random cars and tracks option is saved on going back to lobby. - Ensure sound effects paused during client restart in multiplayer. it is possible to add a some kind of visual slider bar on the HUD? this is to know how much analog steering is applied and how much the mouse is off from center/neutral position ("no steer" state). the same thing can be suggested for when the mouse is set to throttle and reverse controls, to know how much power is applied to the engine. i also feel like the movement of "FixedLook: false" should be inverted to make the movement feel more natural with the car's momentum and weight. the camera should work like, steering left moves the camera to the left, so the car is positioned at the right side. 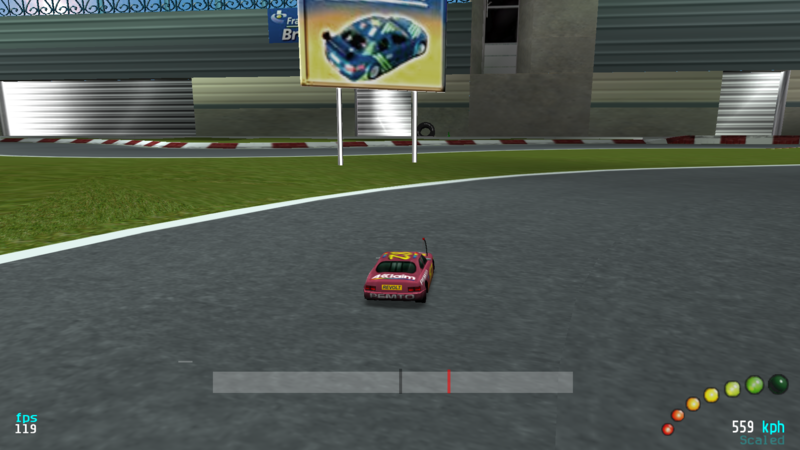 the below pic doesnt feel natural, with the car steering right but the car is positioned at the right side of camera, making it harder to see the corner. camera like this is what i expected when the custom camera has an update. adjustable camera but the camera __sways a bit in an orbit way__ with the car as a pivot point, similar to default cam and close cam. current custom camera update doesnt move in orbit way. it moves in a panning way instead. Mouse steering seems like a fun feature, will give a try! This is a nice update with a lot of fixes. Thank you Huki to also take care of #533.